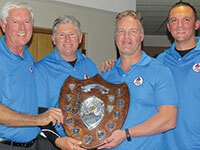 At SAFPA’s annual Golf Day, held on Wednesday 16 May, there was a fantastic turnout of 25 teams. In spite of a light drizzle, the players were in good spirits and the day was a huge success. The winning team was Axiom Hydraulics, with the runner-up being Rand Building Hydraulics. Francois De Lange won the prize for nearest the pin and Steven Witcher had the longest drive. Congratulations to all the winners. Also, a huge thank you to all our sponsors and special thanks to Hydroscand for sponsoring the 18th hole and donating a great prize for the longest drive. The winning Axiom Hydraulics team, from l: Raymond Ramsamooch, Dennis Perumal, Nick Rebello and Nelson Lazarus. The Rand Building Hydraulics runners-up, from l: Wim Greeff, Francois De Lange, Johan Landman and Barry Willemse. We look forward to seeing you all there again next year.